The boghta headdress originate in Mongolia but found echoes in medieval Europe. We appreciate Mongolian culture for its equestrian lifestyle and succulent barbecue, but the Mongolians were also known as connoisseurs of fine art and fashion. In particular, ancient Mongolian ladies of the court made a lasting influence on high fashion that extended even beyond China into Europe. Genghis Khan united the Mongolian tribes north of China in 1206 and is regarded as the founding father of Mongolia. The Mongols became the first non-Han ethnic group to control China and established the Yuan Dynasty (1271-1368) under the leadership of Genghis Khan’s grandson Kublai Khan. As a vast empire that stretched across Eurasia, many artistic traditions were exchanged within its centralized power. Yet, the ancient Mongolians still managed to preserve their own distinct culture with unique aesthetic sensibilities. Pastoral grasslands dominate much of Mongolia’s landscape. Grazers like cattle and sheep not only influenced the Mongolian diet but also their clothing. Wool was the primary source of material for clothes due to an abundance of sheep. 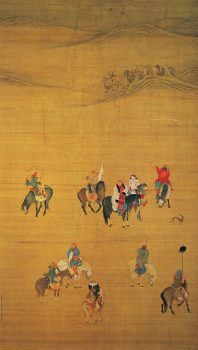 In the painting “Kublai Khan Hunting,” Liu Kuan-tao depicted Kublai Khan along with one his consorts, Chabi, on horseback against the backdrop of the northern steppes. A procession of camels proceed across the sandy desert slopes in the background, while Kublai Khan is escorted by several other hunters and officials. Khublai Khan and Chabi wear white robes made of wool. Their headgear consists of hats with an upturned brim made of felt. All Mongolians loved headgear. While Mongolian hats were traditionally brimless, later ones were designed with wide brims in order to shield wearers from the sun as the Mongolian empire advanced southward. The ancient Mongolian headdresses of women were perhaps the most extraordinary of all Mongolian wear. Married noble women wore the boghta, a symbol of their status. While it was used as formal court wear, it was also worn at ceremonial events like weddings. In the “Portrait of Khublai Khan’s Consort,” Chabi is shown in a boghta crown and stares with a steady, bold gaze at the viewer. This distinctive headdress is almost two feet tall and flares near the top. The cylindrical wooden frame was usually made from birchbark and covered with felt, but the nobility often used crimson colored silk, as in the portrait. Chabi’s hair is tucked inside and the hat is secured to her head with straps. The trunk and the crown is adorned with a pattern of pearls and other precious gems like jade, while the roof of the hat is decorated with pheasant and peacock tail feathers. Strings of pearls and a pair of gold and ruby brooches dangle from the sides. The boghta not only symbolized status but also served to differentiate women from men since their attire were otherwise somewhat similar. 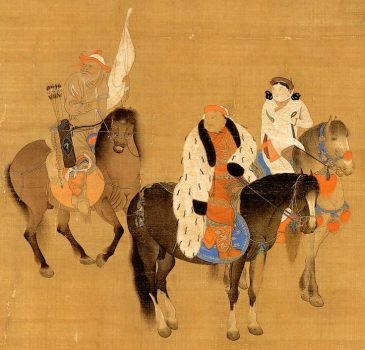 Furthermore, the Mongolian equestrian culture accentuated the boghta as a woman on horseback would appear to have a heightened air of nobility. The higher the woman’s rank, the more elaborate and ornate the boghta would be. Boghta decor also incorporated exotic fabrics and jewels from Islamic Central Asia as the empire expanded. 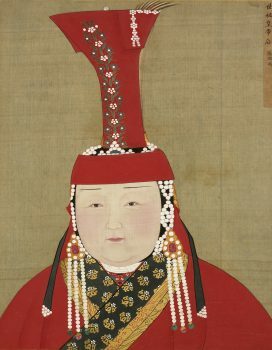 Chabi’s portrait also reveals that she is wearing a deel, which is a traditional form of Mongolian apparel that looks like a long overcoat with two flaps. Deels were designed for different occasions, such as for horseback riding or as formal court wear. The deel Chabi wears is embellished with intricate patterns of gold and silver floral patterns on a black background. These embroideries are known as “nashishi,” which is a unique Yuan Dynasty textile that originated in Central Asia. In this textile technique, thin filaments of gold are interwoven together with silk strands. The artist uses gold pigment to depict this luxurious type of brocade in the painting. 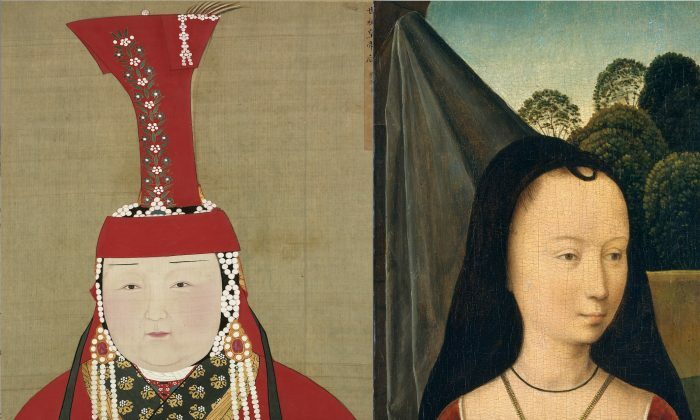 Mongolian fashion expanded its impact especially when a foreign ruler took a Mongolian princess to wife, such as in Korea, and she influenced the court there. Likewise, other regions adapted some Mongolian dress due to their vicinity to the empire. The long belted tunics that medieval Russian princes wore, for instance, had similar features to the deel. Yet, out of the entire wardrobe of a Mongolian court, it wasn’t the deel but the boghta headdress that captured the attention of many who visited the empire. Eastern and Western travelers were fascinated by the boghta and described it in vivid detail. Historical accounts show that when Marco Polo traveled to Mongolia in the 13th century, he brought back a boghta to Europe. 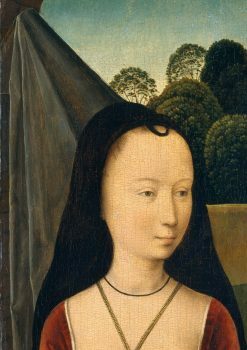 This influenced the development of the hennin headdress worn by European noblewomen during the high medieval ages. Rather than rising straight up like the boghta, the hennin was a conical hat that tilted towards the back. Lacking peacock feathers, they added gauzy streamers instead. Today, the hennin has become a symbol of nobility and femininity of the Medieval period. In fact, the highly recognized medieval princess hat is directly modeled after the boghta hat of Mongolian queens. Mike Cai is a graduate of the New York Fei Tian Academy of the Arts and the University of California–Berkeley.